Pacline’s enclosed track Power and Free Conveyor is a medium capacity conveyor system, ideal for a wide range of manufacturing processes and assembly applications. Painting, curing, sequencing and buffer storage are some of the common applications of power and free overhead conveyors. The Pacline Power and Free Conveyor system uses a square track and chain for the powered portion of the conveyor system. The “free” track carries the product load, parallel to and directly below the power track. 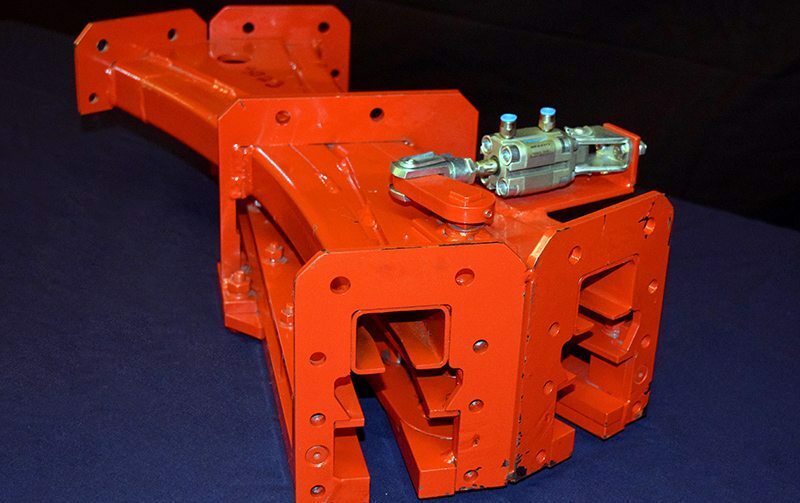 The free track is an assembly consisting of two formed channels to suit the free trolley load and guide wheels. 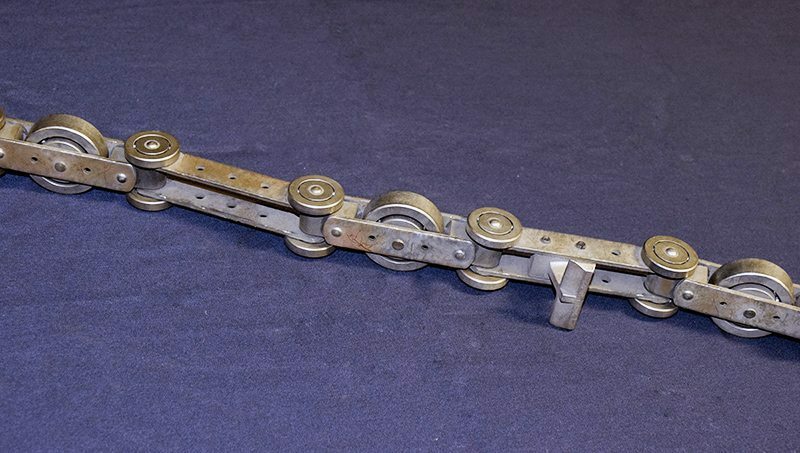 Attached to the motor-driven chain are the pusher-dogs, which convey the free-trolleys around the system. The ability for the trolleys to disengage from the pusher-dog is what makes a conveyor “Power and Free”. Unmatched loading and unloading rates are possible since the trolley and carrier can separate from the powered chain. Like all of our overhead conveyor systems, the Pacline Power and Free Conveyor system is designed to free up valuable floor space. Here is how it works: A sequence of switches and stops allow the trolleys to become independent of the power track for processing or transfer operations. The trolleys can be rerouted onto adjacent spur-lines or stopped in-line. Furthermore, logic control of these devices allows for total automatic operation of the entire conveyor system. Utilizing either an off-line sprocket or in-line caterpillar drive ensures years of trouble-free service. Either drive can be positioned in the most advantageous location on the system. Drive height is compact. Four hanging points are provided, one in each corner for convenient hanging. The square enclosed track is shipped in 10 ft. lengths for easy handling. Track length can be easily modified in the field. 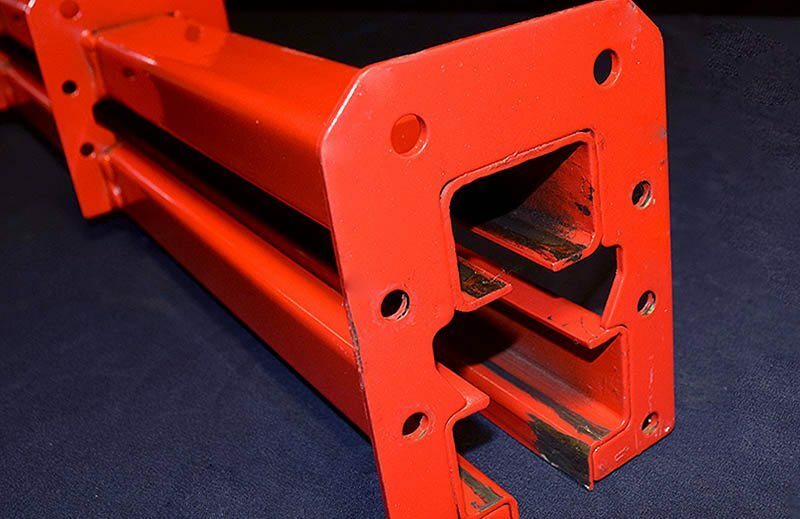 The enclosed track protects the moving chain from paint spray and other contamination and, provides built-in runaway protection for the chain. Horizontal and vertical curves come standard in 24” radius. 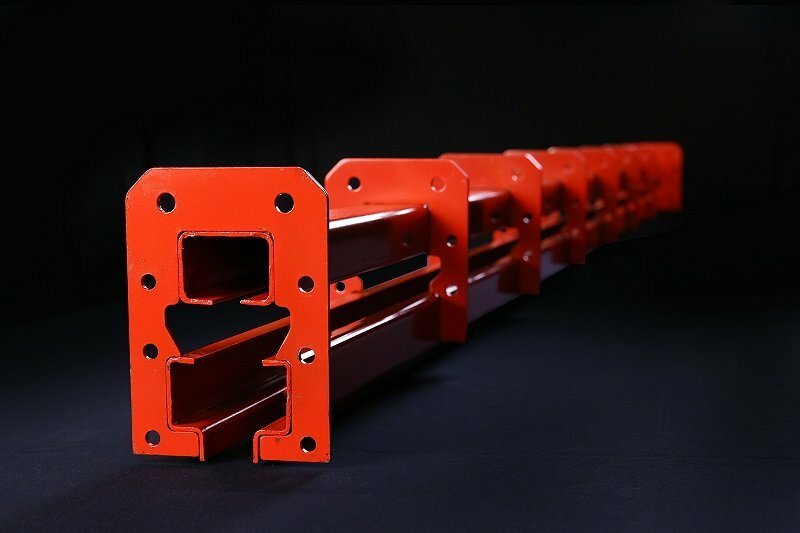 Our standard Red colored, powder coat finish is distinctive and easily identifiable. Pacline’s Power and Free conveyor chain is designed to provide maximum flexibility in all directions. The chain is stamped from high quality, alloy steel providing a high tensile strength. The component parts are heat-treated for full protection from wear as well as resistance to corrosive environments. The machined ball bearing wheels with hardened race provide long, smooth running systems, capable of conveying heavy loads. The chain will operate satisfactorily at high temperatures in oven applications. The extremely low friction design of our chain ensures many years of trouble-free service. The free-trolleys can be set-up with a single trolley combo or 2 or more trolleys which articulate with load bars to go around the corners to suit the accumulated length of the loads. The front trolley unit has a latch that engages the pusher-dog and the rear trolley unit has a “tail” that deflects the pusher-dog. When trolley sets are accumulated together, the tail of the first one contacts the front trolley flappers of the second trolley set, and so on. This prevents the pusher-dog from engaging the trolleys in accumulation. The trolleys are designed so that they will not derail. The trolley heads have two pre-lubricated ball bearing wheels each, making them very low-friction and maintenance-free. Each trolley has the capacity of 200 lbs. Load bars can be added to expand the weight capacity. Trolleys can be disengaged from the pusher-dog by using a stop mechanism. 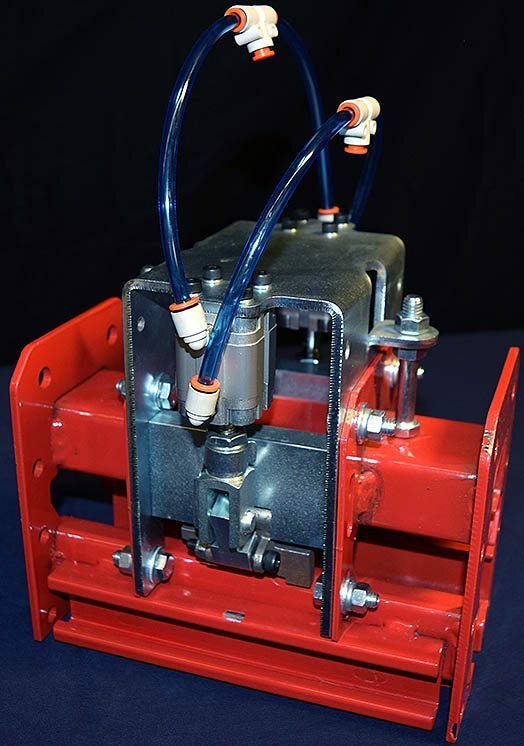 The wedge flipper on the stop is extended by a pneumatic cylinder so that it depresses the flappers on the trolley. The trolley separates from the pusher-dog and remains at the stop. The next trolley will disengage from the pusher-dog when it reaches the tail of the first trolley, thus accumulating trolleys for storage. When the stop is retracted, the first trolley will be engaged by the next available pusher-dog in a first-in-first-out (FIFO) fashion. The cylinder is automatically controlled by a solenoid that receives a signal from the PLC. 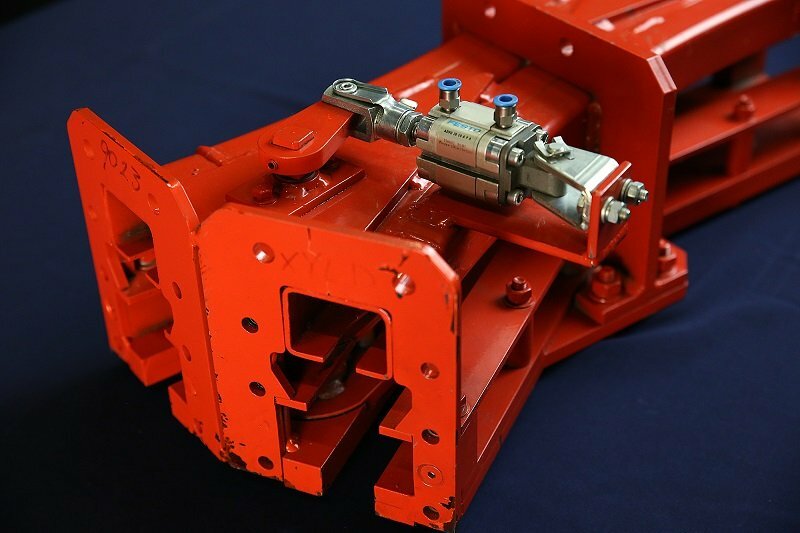 The stop can be mounted anywhere along the straight sections of conveyor where discontinuous product flow is needed. Note, trolley accumulation zones need to be on straight, level track sections, not on curves or incline/decline track sections. “Pork Chop” Actuator– The pork chop provides a momentary signal from the limit switch when a trolley passes by. This is adequate for sensing trolleys or activating track switches. “Ski-Bar” Actuator – The ski-bar is a device that provides an extended signal from the limit switch. A long contact surface allows the ski-bar to maintain contact with the trolley over a greater distance. This is ideal for indicating when an on-line or buffer accumulation area is at capacity. Trolleys will be diverted into other areas of the system until there is space available and the ski-bar has been released. The track switch allows transfer of trolleys off and onto the main conveyor line. The track switch is activated by a pneumatic cylinder. By integrating limit-switch actuators and track switches with the PLC, operation is automatic and error-free. Additional safeties are implemented so that the trolleys will never run off the end of an open track. Parallel storage spur-lines are as close as 24”, allowing optimum usage of plant space. Also, trolleys transfer directly from one power track to another; in other words, there is no need for an external device to “feed-in” the trolleys. Prefabricated, modular design ensures quick, trouble-free installations and modifications.